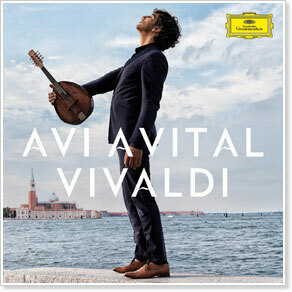 Berlin, Germany — Deutsche Grammophon has announced a February 25, 2015 release for Vivaldi, Avi Avital's newest project. On the recording Avital pays homage to the sounds of Venice and beloved composer of the Italian Baroque, Antonio Vivaldi, with four popular concerti with the Venice Baroque Orchestra, an 18th Century Venetian Gondolier song performed by Juan Diego Flórez, as well as the Trio Sonata in C major with Mahan Esfahani and Ophira Zakai. Oh my. Burned rubber on my mouse rushing over to Amazon to get this one. Jeff always beats me to the comment section. But that did not slow my pace to the 'add to cart' button for this one. Avi is one huge inspiration. Very cool. I wonder what he is cooking up next? I love that video. Lots of "mandolin face". That look at 47 seconds, made me want to buy the CD right there. That is one gorgeous mandolin. I do love the sound of those Kerman mandolins. I have never heard one but recorded, I would love to hear one in person. I would love even more to play one in person. i guess we should post this video, where he talks briefly about his Kerman and you get to see it more closely. I think ill buy this album, even though im not much into classical music, i listened to some of his vivaldi pieces on his spotify page and actually liked it quite a bit. So ill check it out, who knows maybe it will be a stepping stone into classical music for me. I asked friends to watch out for mandolins when the visited Italy - including Venice. The didn't see anyone playing. That would be disappointing for me. I would have thought they would want a mandolin and gondolier just for atmosphere. I just listened to the Vivaldi recording and was amazed at the extremely high quality of the music. Avital's technique is wonderfully clean and precise plus the sound quality is great. The finest classical recording I have heard in a long time. I like it. no doubt Avi is an amazing player. You can also see him perform on the tiny desk concerts! Very cool. Just finished listening to it through the second time. This may be my favorite one of his CDs to date. Just listened to album. I thoroughly enjoyed it! I get to see Avi, et al, on Tuesday!!! Here in backwater Edmond, OK!!!! Tickets are boughten and everything! I want to recommend Avi Avital's last cd: "Between Worlds." It's a great collection of piece with a variety of musicians. And he blends in well with others I think. Quote from Nick Royal: I want to recommend Avi Avital's last cd: "Between Worlds." It's a great collection of piece with a variety of musicians. I second that recommendation, Between Worlds was an absolute fantastic CD. I have always been a fan of Vivaldi, so this latest CD tops them all for me, at the moment--until whatever is next!